Alf and I are on the road again in beautiful Beryl. This time we’re heading through France to Spain and probably Portugal. I say probably because there is, as ever, no definitive plan. The only plan is to visit a couple of friends who live near(ish) to Marbella – apart from that we’ll just go with the flow. When I headed out on my last and first big trip, in my van, last summer in Europe and Scandinavia I thought it would probably be a one off – after all I’d need to go back to work. Well things didn’t quite work out that way, I ended getting the chance of redundancy which I grabbed it with both hands. Even after 21 years it wasn’t a difficult decision – especially as I was sat by Lake Siljan in Sweden. I can remember it vividly – I had little cheeky chaffy the chaffinch sat by me (this bird spent the week I was there in and around my van) and Alf snoring on the ground – looking out at the beautiful lake, knowing there was more to life than sitting in an office everyday. I haven’t regretted the decision for a minute and I know I’m incredibly luck and feel grateful everyday. It’s been an amazing couple of years – after my trip last year I spent some time at home and at the start of this year I travelled around Nepal and India for a few months – which anyone who has been following my blog for a while would have seen loads of posts from the trip. Since then I’ve been back and home and been out and about in Beryl sometimes with new friends that I’ve made though a Mazda Bongo group on Facebook. I also worked for nearly 6 months at Royal Holloway University. I was lucky again – I didn’t need to go and search for the role – a friend / past colleague recommended me for the role. I was even luckier to have such a great experience there. Not only is it a beautiful environment to work in (Founder’s building is I think one of the most beautiful in England) and so different from anywhere I’d been before but the team were brilliant – it was a real pleasure work with them. I has also given me the confidence to now step into different industries and organisations and be able to fit in quickly – and of course try to make a difference whilst I’m there. When the contrac t finished – it was either time to look for another one or to go on another trip. As you can imagine that wasn’t a very difficult decision to make. The time of year dictated the location as much as anything and the fact I’ve got friends I’d like to visit in Spain. Preparing for the trip really meant getting the van and Alf ready. Beryl my van had a full service, a new radiator, shocks and exhaust and actually a new paint job but that wasn’t for the trip – she needed a respray under warranty as the original was badly chipping. Alf is getting older and his arthritis troubles him – so I got a back pack for me to carry him in and got a full health check to make sure his heart murmur was no worse – which thankfully it wasn’t. I don’t like to plan the route too much – or at all – though I have been following lots of Facebook groups to see what other people are doing. I did have a minor panic just before I left when I realised that most of the campsites in Northern France are now shut. I know I can use aires but not all have toilet facilities, and whilst I do have a wee bottle on board – I really would prefer a toilet. With the help of several apps and downloaded POI’s it’s not been difficult. A few recommendations for anyone doing something similar park4night, asci and camper contact – are all great apps you can download and search for open all year – and by downloading them you don’t need to worry about b eing online. I know there are books too – but I find the apps easier. I’ve also then got the POI’s loaded into my Tom Tom so it is easy to find them. My first days travel took me to visit my cousin/friend on Dover via Reading. Reading is not on my way but the roof light was flashing so I popped into my trusted bongo (Beryl’s a Mazda bongo) garage 321away and it took them 5 minutes to fix it. I think they are prepared to get a few of my ‘Blonde’ calls on the journey – but you never know I might manage this trip without it. On my first trip to France after a very long day and tiring drive I could not get the bloody keys out of the ignition. I called – they explained – the van had to be in park. Just a tad embarrassing! After a lovely first night catching up with Katie and having a few ciders, Alf and I got to the euro tunnel early. The lady who checked the ticket on Beryl asked me if I liked purple. 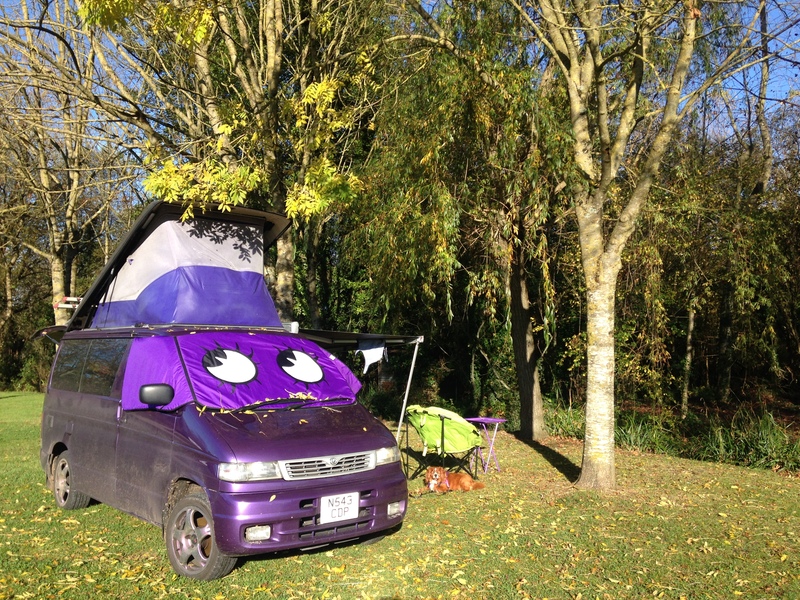 Now given that my van and pretty much everything in it is very purple (and my hair and Alf’s scarf) are purple – I strangely get asked this question quite a bit! On occasion I’m tempted to say no, why what on earth makes you think that? But, I was well behaved and confirmed that yes I do indeed like purple – just a little!! the road – I just keep repeating to myself that I need to be on the inside. I struggle with right and left – don’t ask me why I just do – it confuses my brain so I now avoid it! 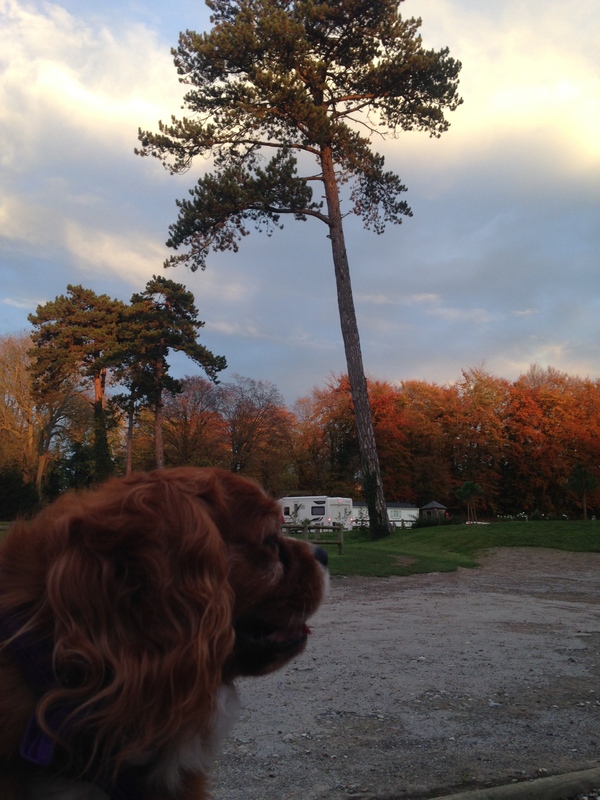 Our first night stop was near Abbeville in the Somme on a lovely campsite surrounded by gorgeous autumn colours. It was a mild afternoon and evening so we sat outside reading – I say we, but as you might imagine I read, Alf on the other hand did what he is great at and snored. It takes Alf a little while to get into a trip. At home he sleeps a lot of the day but unfortunately he doesn’t really sleep when I’m driving so he’s pretty tired when we arrive. So I have to make sure there is nap time scheduled in. He was even happy to stay up in the roof tent the next morning when I went to collect my morning croissants – and yes I did say two – well it was a treat! I started the next day with a quick visit to Abbeville in and a pretty Chateau – I couldn’t park at the Chateau as the barrier was far to loo for Beryl but there was no one around so I just took a few pics. I find at the start of a trip I want to get on with the drive – which that day was around three hours to near Dreux. The campsite was in a tiny and quaint little village. 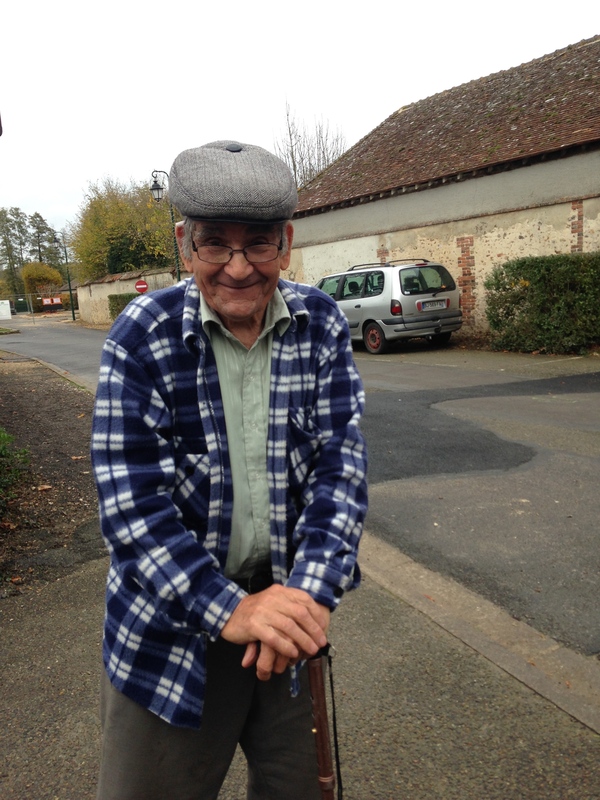 As ever with French villages there weren’t many people around – expect for an old man at the entrance to the campsite who wanted a chat. Unfortunately my french is pretty non existent but I managed to ascertain that he was 80 years old, which he obviously proud of, and his name began with an M – but i couldn’t pronounce it. He was happy to chat away, and wasn’t at all that bothered that I had no idea what he was saying! After wander around the village Alf and I popped into the local bar for a glass of red – rude not to! The next day we headed to the Loire valley – as much as anything my stops had so far been planned around where there were open campsites on the ASCI app. When I was looking through different sites from home – a lot said they were for sites open all year but then you looked into and they closed in October. So far the ASCI ones have all be correct. What I had forgotten to say is that morning at the first campsite and english lady who was at the end of her trip came over and gave me her ASCI books – whilst I had the card I didn’t have the french book so it was quite handy as a back up and very kind of her. The drive through the countryside was beautiful, long straight roads broken up with navigating through little villages. The morning had started out quite sunny but it soon clouded over – a lot of the villages look at bit dull with the grey buildings against a grey sky but i could imagine they would look quite different contrasting with a beautiful blue sky. I stopped at an intermarche to use the loo and just had to grab a baguette and some cheese – I had loads of food on board but I was in France so it just had to be done. I had a snack whilst standing in the car park and stretching my legs. As I got nearer to the campsite I started seeing signs for wine caves – so as soon as I saw parking sign just after one I quickly pulled in. I tried a few chenin blanc’s, merlot and a savignon – all very nice and a perfect way to end the day’s drive. That night’s campsite was next to a restaurant – now at home I wouldn’t have bothered trying it with Alf but I was delighted when they let us both in – not batting an eye at Alf and thankfully they had an english menu as well. 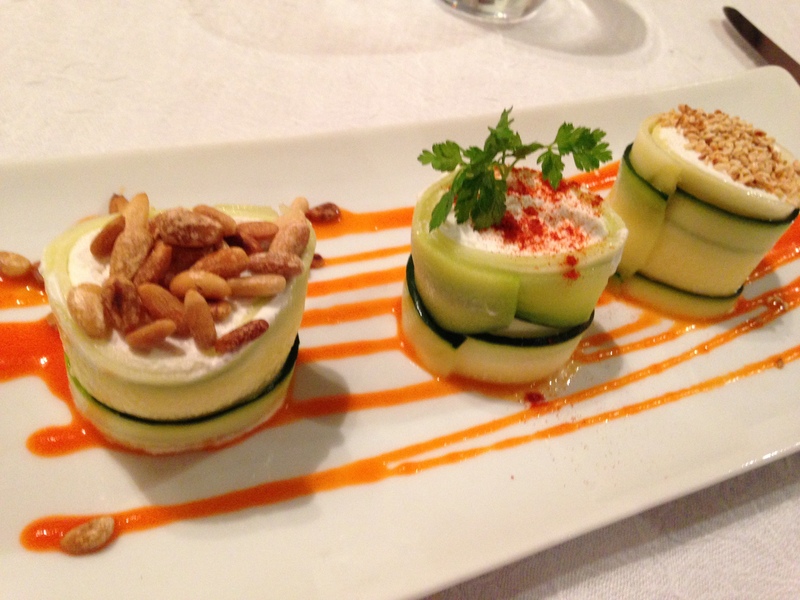 The meal was absolutely delicious – zucchini or courgette depending on what you want to call it wrapped around the creamiest goats cheese followed by a ballotine of crab and a coffee parfai. I don’t eat meat, but i do eat fish on occasion – which is lucky as there were no vegetarian options. The following day turned out to be a lot longer drive than expected. I started off visiting Monterichard. 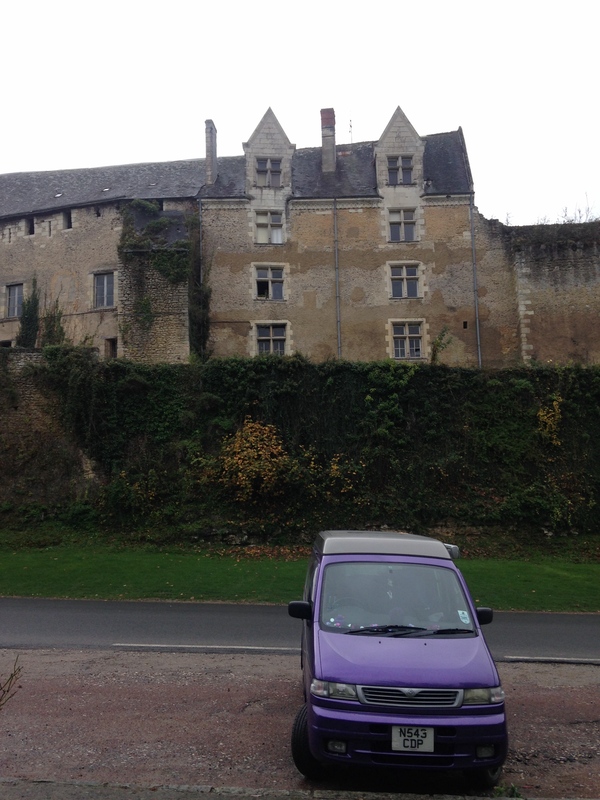 Alf and I had explored the chateau at Montrichard – i check that it was OK to take Alf in – and the owner (I assumed he was) said that just make sure he was clean as he had some very good carpets. So we duly wiped our feet and headed in – there were some beautiful carpets – as well as some horrible stuffed animals – a beautiful wolf hanging upside down. I can accept this behaviour years ago – but it’s when you think people still see hunting like this as sport that i just shocks me – anyway I digress. We couldn’t explore the second floor as there was a spiral staircase which Alf refused to walk up – no idea why but he was not having it. Before we headed off we popped into a little bar opposite and I had a beire sans alcohol – not something i normally drink but I don’t drink and drive when on a trip (I might have one at home). I got chatting with a group of men having lunch near me – it is amazing how having a dog helps start conversations. I passed through some absolutely amazing medieval villages – I didn’t stop as I was due to arrive at the Aire I’d chosen at 15.45 which was a bit later than I would have liked. It was my first try at an Aire so I didn’t want to be late and it’s lucky I didn’t stop because it was shut – a shame because it was in the most incredible village. I had already identified another campsite which was an hour way – so I carried on driving – hoping to arrive before dark. Literally 1 minute before getting to the site I spotted a sign for an aire – it was perfect – on a green by a little stream. No electricity but it had a loo – which for one night is more important. So I skipped the site and set up camp next to a couple of french motor homes. As my first expeiene of an Aire it was perfect – and the prettiest camping spot of the trip so far. 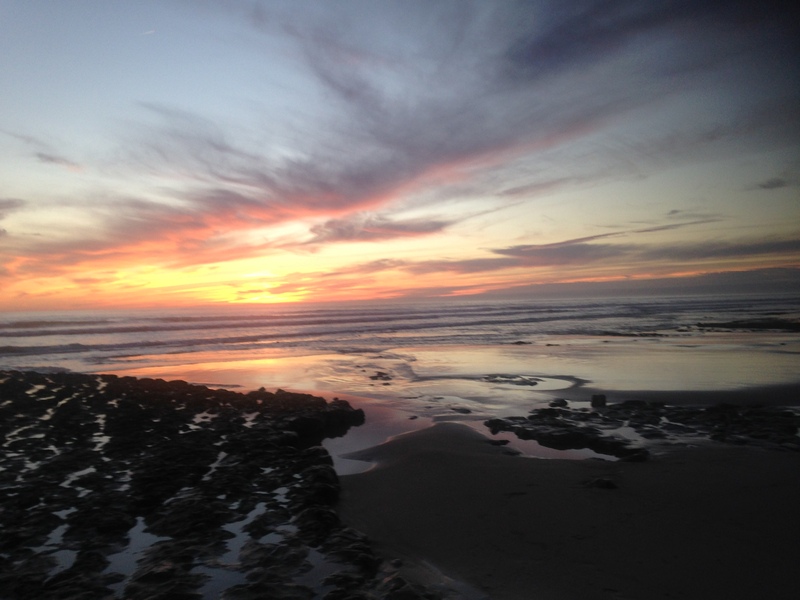 The sun was out the next morning and I was on a mission – I wanted to get to the beach. 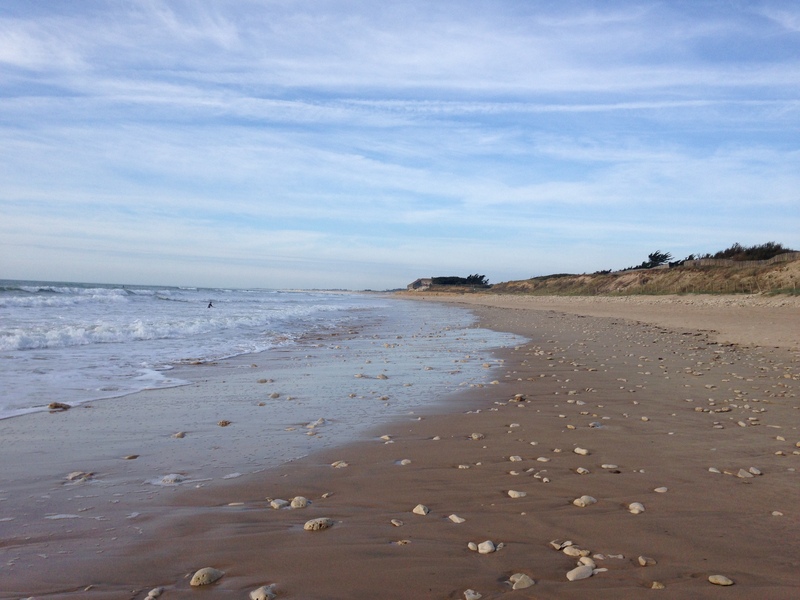 We arrive in Ille De Re (a little island just off La Rochelle) at about midday – over a two mile long bridge. Now anyone that followed my trip to Scandinavia before will know I didn’t like driving over bridges. Well i couldn’t believe it – I was driving and smiling – and more importantly breathing – I think I might be cured! As soon as I got over the bridge i spotted an Aire – but it looked like it as 20 euros . I decided to head on to the campsite and I’m glad I did with my ASCI card it was 17 Euro a night. I read that this island is describes as the French Hamptons – it also reminded me a bit of Gotland off Sweden – not quite as pretty as Gotland but some similarities. The sun was out so it is the perfect place for Alf and I to stop and stay still for a few days. A bit of along first post – if you’ve got this far – thanks for persevering! I’ll try and keep them shorter in future. ← Om Guru Om, Om Guru Om, Om Guru Om . . . . . .
Best of luck Thea, on your second European adventure! GIRL POWER!